The toolkit organizes material into overreaching themes, such as building community support, establishing policies to encourage investment, and the pros and cons if publicly owned models, among many other considerations. Within each broad topic, however, NCC has dug deep into specifics, such as addressing simplified permitting practices, creating digital inclusion plans, and ways to work around legislative or regulatory barriers. Throughout the toolkit, NCC turned to the many members of the organization for real-world examples of workable solutions. 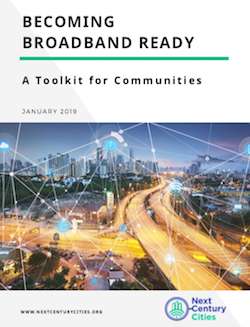 Download Becoming Broadband Ready: A Toolkit for Communities.